Vyapar Yantra bestows success and wealth to user. This Yantra also grants prosperity, success and satisfaction to its users. It blesses the worshipper with accomplishment of goals, fulfillment of targets and overall success in ventures. Every House, Shops, Temples and all the places should be constructed according to Vastu. - Vyapar' means business and 'Vriddhi' means increase. As the name signifies, this Yantra increases sales, turnover and profits in business or profession, and blesses the owner or holder of this Yantra with success, progress and prosperity in work career. Banking on our enriched industry experience, we are able to supply Vyapar Vridhi Bhojpatra Yantra. Banking on our enriched industry experience, we are able to supply Sri Vyapar Vridhi Yantra on Tortoise. - During such times, installation of a Shri Sampurna Vyapar Vriddhi Yantra in our workplace can prove highly effective. We are a top notch supplier of Vyapar Vriddhi Yantra. 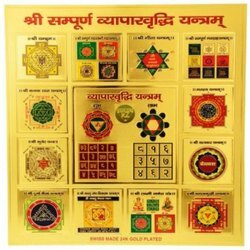 We are a top notch supplier of Vyapar Vridhi Yantra. 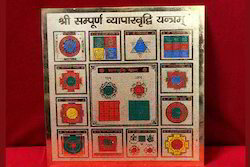 Vyapar Vridhi Yantra is available on very reasonable rate. Lamination Will be provided as per demand having additional cost Rs. 8. We are a top-notch organization, engaged in providing Sampoorna Vyapar Vridhi Yantra. Yantra is considered one of the most auspicious for the combined worship of Lord Ganesha and Goddess Lakshmi. Lord Ganesha is the God of Success in all ventures and undertakings. - size 9x9 inch Suitable to keep in Worship place , Can Be Hanged On Walls. - Put At working Place or in Your Temple there or Hang on Wall And Worship, It will Defiantly Help you to Rise And Gain in Business. - It Helps to Grow Business.